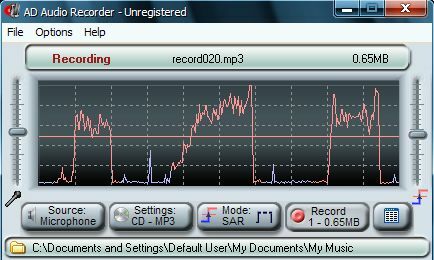 AD Audio Recorder is a sound record program for Windows. It can record in normal mode as the most known audio recorders and in sound activated mode SAR. Intuitive user interface and sound visualization in real time make easy setting and adjusting of recording parameters. Flexible SAR settings allow you to set threshold, time for activating of recording, pre-active and post-active recording time. AD Audio Recorder can record any signal from your sound card including live streaming audio from the internet, audio from movies and music played by the most popular media players into MP3 and WAV stereo format. Advanced sound activated recording allows you to save your audio notes and skip silent passages in any streaming audio. You can manage and play the recorded files just after recording with the file list and a built-in player. Automatic stealth Skype recorder. Parental Skype recorder launches automatically on Windows startup, works silently and shows no icon on the taskbar or system tray. All type of calls are automatically recorded to compact mp3 files. This site does not contain serial number, crack, keygen AD Audio Recorder serial number : serial number is the simplest type of crack. A serial number(cdkey,product key,etc) is register the program as you may already know. a crack or keygen may contain harmful software. If you cannot find the exact version you want, just give it a try. for more information read .nfo/.txt/.diz file include in zipped file.